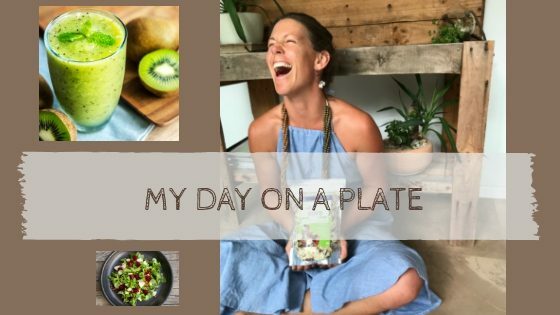 What I eat on a typical day,, when I’m at the markets on weekends & now (when I’m detoxing)! I think because I studied as a naturopath, people ask me what kind of diet I follow – am I vegan, vego, paleo, keto, sugar free, gluten free etc…there are loads of ‘diets’ that a naturopath may recommend depending on the circumstances, but most of us are pretty normal but with a few ‘rules’ we try & stick to, different for all of us depending on our own values, health situation, living situation & of course what is trending in healthy circles! So here’s a typical ‘day on a plate’ – I don’t follow any diet, just try to minimise my intake of gluten, refined carbs & sugars, processed food & artificials. I try to make sure a high percentage of what I’m eating is organic & get as much as I can locally through markets instead of supermarkets. I grow a few things in the backyard. I focus on loads of veggies & plant foods though I do eat animal products too (I’ve had a go at being vego & vegan a long time ago – not to say I wouldn’t go there again if it felt right, but for now it doesn’t). I eat loads of fat, fibre & adequate protein, & treat carbs & sugar with respect as I know how addictive they can be (been there). I used to be a lot more concerned with ‘what is the perfect diet for all humans’ but now I think it can vary so much, from person to person & life stage / circumstances / climate / lifestyle – now I tend to just listen to my body, & tweak food accordingly. I eat not first thing, but after a morning dog walk (& / or a surf if I’m lucky)! Gotta move before food. Leftover market tasters don’t get wasted! Soaked Blend11 / NeoBlend & coconut yoghurt (of assorted types) will go into the blender with frozen berries, & whatever else – maybe cacao powder / vanilla essence / greek yoghurt / a banana / maca powder / cinnamon / protein powder etc. I just make a big batch of whatever combo works out yummy enough that the kids will down one too without complaining (ok sometimes when I don’t nail it there is complaining & maybe a lunchtime smoothie for me)! We might do a smoothie bowl topped with a little crunchy granola / Blend11, or some Bircher muesli…& an omelette / egg breakfast if there’s time! Sometimes I might just have some buckwheat toast with avo / hommous / nut butter / butter on my way out the door, & I love porridge (with extra toppings) in winter. I’m totally a breakfast person, very rarely do I not want to eat in the morning, only if I’m unwell….but I definitely feel like I need to exercise before eating, even just a short walk is so much better than zero. No morning exercise = I feel a bit ‘meh’ physically & mentally…gotta do it. Lucky I’m an early riser & the dogs are too! Packed lunch of salmon / chicken / tuna / turkey / avocado / legumes / olives with salad or just some leftovers from a dinner. Or if I’ve not been organised enough to pack something good it’ll be a few rice crackers with avo or tuna or more leftover seeds & coconut yoghurt…or I’ll graze on ‘BallBags’ tasters from the freezer – there are more days than I’d like to admit where these are my staple at work! (I get in trouble for eating the profits). Home to meet the kids (usually) for an after-school / pre-sports-substantial-snack.. Maybe avocado,, hommous or nut butter on GF toast / tamari with greens & shredded fried eggs / leftover dinner / olives & cheese with veggies & dips platter…a smoothie if that wasn’t breakfast already. Though being teenagers, it’s pretty common they’ll walk in with some handful of garbage just to bug me! I often eat bits & pieces of whatever I’m making for dinner, tasting as I go / just because it’s there & I like food…some nights I might have a wine or 2. Some sort of meat & / or legumes with a tonne of veggies, usually a twist on Aussie kid faves like spaghetti bolognaise or some kind of ‘Mexican’ (I can chuck all kinds of things in there, including seaweed, beans / lentils, herbs, turmeric, molasses but still make it yummy)! We may do a BBQ, homemade pizza & greens or have a chicken curry teamed with rice / lentils / quinoa, or a fried rice to use up leftovers (& increase our resistant starch intake)!, Sometimes a slow cooked lamb or beef hotpot in winter, or shanks…there’s almost always a salad on the side,, especially when my garden is cranking. Sometimes we sign up to the meal-in-a-box deliveries for a while (I like that it forces us to try new recipes / ideas that are quick & easy to prep with no time wasted on shopping & decision-making, sometimes it’s just a matter of figuring out which kid is cooking tonight, (we try to get them all cooking, once a fortnight each when we’re on top of it)! I’ll often add extra veggies to these / & try to un-select all the bread & pasta dishes. If I’m feeling like just a ‘little something sweet’ at night it’ll be some of the Pure n Free chocolate mousse / vanilla coconut yoghurt with berries, or the caramel one with banana & cinnamon…or the ever present BallBags taster cubes! Sometimes plain dark chocolate, or just a piece of fruit. In winter I’ll often have a licorice tea. This is a typical day at home during the week – when at markets on the weekend it’s completely different! (after driving & setting up the stall, & usually being up from 3 or 4 am) I’ll treat myself to a hot breakfast! Usually some sort of egg based breakfast with plenty of veg. Faves are the buckwheat wraps from PBC / Brisbane city / Bundall markets & the potato cake thingies with egg / avo from Powerhouse, or an omelette at Northey St. I may have a black coffee a little later if I’m not feeling energetic enough to power through the day, though I’m trying to get out of that habit as coffee dumps me quite hard in the afternoons, & I don’t want to become too addicted / reliant on it…plus my sleeping can be a bit messed up with the early starts. I just graze on market tasters throughout the day, ie PondWater in lemon water, BixMix crackers, Blend11 with coconut yoghurt…I’m lucky there’s no need to go elsewhere for food, though I do pick up most of our weekly shop at markets & might eat some fruit too. So that’s me…that’s what I eat right now…Pretty much everything, not a strict food-nazi naturopath but I do have some standards! This entry was posted in General Health and tagged gluten free, naturopath diet, Sugar free.